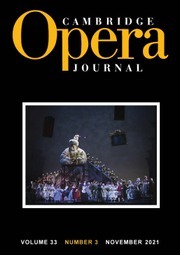 Containing lively and provocative essays, Cambridge Opera Journal has a well-established reputation for publishing first-rate scholarship on opera in all its manifestations. The Journal not only contains material on all aspects of the European canon, it has now widened its scope to publish high-quality essays on American opera and musical theatre, on non-Western music theatres, on contemporary works. Carefully researched and often illustrated with music examples and pictures, articles adopt a wide spectrum of critical approaches. As well as major articles, each issue generally includes reviews of recent publications of importance in the field.